The best elliptical machine for home isn't always the most expensive. In fact, these cheap ellipticals are ideal for home use because they are compact. You can get a pretty good elliptical trainer for a surprisingly low price. Treadmills, on the other hand, are much more expensive to manufacture, they are bigger, heavier and have motors and belts that tend to wear out. Ellipticals on the other hand, cost less to produce, are lighter and don't require big motors to run. Bottom line, if you don't have much to spend, get a cheap, but good elliptical, period. That's why we put up this article, duh! If you got more to spend it is only then you can look at treadmills or exercise bikes or obviously more expensive ellipticals. But before you get all too excited it's worth spending just a couple of minutes reading this article to make sure you get one that suits your needs. Ellipticals are great for losing weight, getting in shape or just to maintain all-around cardiovascular health. Footprint: 21" x 14" x 14"
Footprint: 43" x 28" x 53.8"
Footprint: 33" x 19" x 46"
Footprint: 37.8" x 26.6" x 60"
I'll begin by saying that I personally love ellipticals (also called cross-trainers) mainly because they're are low impact. In fact, even though I have used all aerobic machines over the years, for the past decade I found myself using elliptical machines more than treadmills or exercise bikes. Even if you've never stepped onto an elliptical machine before, you'll be able to use one with ease. You place your feet on the platforms, which are often called pedals, and then start to move with a back and forth gliding movement. Most elliptical trainers have handles that help you maintain balance. Usually, these handles move in rhythm with your feet, which gives you a great upper body workout. There are also models that don't have handles. You've probably never seen ellipticals like this at the gym. Before you dismiss them, let me give you something to consider. The lack of handles means that you have to engage those all-important core muscles when you're using the machine. Plus, you can always use light hand weights to change things up a bit and get a full-body workout. I love elliptical trainers because they are genuinely easy to use. However, that doesn't mean that you can't get an intense workout. Most ellipticals, have adjustable tension. If you're feeling a little sore one day, maybe you turn down the resistance a bit. On those days when you're feeling powerful, you'll dial it up. Even base-level elliptical trainers include simple computers that track useful data like how long you've been exercising, how fast you're going and how many strides you've taken. I like to write down the stats of my workouts after I complete them to track my progress. It gives me tangible goals to work toward in each session such as trying to aim for more time or longer distance. Elliptical machines are a terrific choice for people who are dealing with any number of physical issues. Whether you have arthritis, experience general joint pain, are coming back from an injury or just haven't exercised in a really long time, you can gain tremendous benefits from using an elliptical trainer three times a week for 20 minutes to half an hour each day. For one thing, this cardiovascular activity increases your aerobic capacity. In other words, you'll develop your ability to complete everyday physical tasks, like going up the stairs, without getting out of breath. Another benefit of elliptical trainers is that they offer an opportunity for low impact exercise. You won't put any undue strain on your knees or ankles. If your doctor recommended a safe, low impact exercise routine for you, chances are good that this activity was high on his list. Ellipticals are also great when it comes to correcting muscle imbalances. Most people have stronger hamstrings than quadriceps, and this can cause problems like back pain. Regular workouts on an elliptical machine can build up your ﻿﻿﻿﻿quads. You'll be taking the stairs in no time. I've always thought that the elliptical trainers at the gym were great. They're big, heavy-duty machines that are built to take a daily beating. The stride length on these trainers is long, so people of any height can feel comfortable using them. However, you can't deny that exercising at home is very convenient, that's why the market for ellipticals have grown so much for the past several years. Most people don't have room in their homes for the same kind of full-size elliptical machines that you see at the gym. With space at a premium, it's important to look for a compact trainer that still delivers a decent workout. In addition to not taking up a ton of space, these compact elliptical machines tend to cost a lot less. That's great because most people can't afford to pay several thousand dollars for an exercise machine. If that's the case for you, it doesn't mean that you can't have an in-home elliptical machine, it just means that you have to find an affordable model. All of the elliptical machines that I review below share a few things in common. One of their most important characteristics is that they are quiet. With no big motors like treadmills have, ellipticals are less noisy. This means that you can use them without disturbing your family or your neighbors. Just as valuable, you can easily read, watch television or listen to music at a reasonable volume while you get a great cardio workout. The best way to keep your elliptical machine operating quietly is to perform routine maintenance on it. Typically, this means tightening a few nuts, bolts and screws. It may also be necessary to lubricate certain portions of the trainer. Keep the owner's manual for the machine you buy in order to stay in-the-know regarding what kind of maintenance your elliptical needs. Most of these machines also have smaller footprints when compared to other exercise equipment you could have in your home, like treadmills. If you haven't got a lot of space, then the machines I listed here may be an option for you. Plus, some of these trainers are incredibly easy to store in a closet or under a bed when they're not in use. That's either because they are very small, fold up for easy storage or can be wheeled out of the way. If you're not going to have a permanent spot in your home for an elliptical, then it's vital to look for a machine that has these qualities. Another advantage that each of these models share is their simplicity. They don't have motors like treadmills do, so there are fewer opportunities for having mechanical issues. That means you'll spend more time exercising than you do repairing the machine. When you keep things simple, there's a lot less that can go wrong. The market has changed, ellipticals that you once had to pay for double the price, are available today for half the price. Granted, these budget ellipticals won't outperform top elite expensive ellipticals, they don't have to. But for their price, one-fifth to one-tenth of the price of the more expensive models, they are worth every penny. As far as burning fat and losing weight, you can burn just as many calories on a cheap elliptical machine than on a more expensive one. If you don't mind to forget about the bells and whistles that the more expensive models offer, and make some small compromises, you'll get good bang for your buck and your body would be thankful too. The Stamina is not really an elliptical in the sense that it doesn't have handles to hold on to. The Stamina is essentially only the lower part of the elliptical, but if you're looking for a workout machine that's light, compact and portable, then this model is perfect. Weighing about 25 pounds and with a footprint that's considerably less than two square feet, this machine is readily transportable. That's good news because it means that it's easy to pull the In-Motion trainer in front of the television for workouts, and then just as simple to put it away in a closet or under the bed. The In-Motion is also a good choice because it's a snap to put together. You don't have to be mechanically inclined to have the whole thing set up in about five minutes. Perhaps the most difficult thing to get used to with the In-Motion trainer is the relatively short stride. That's an inherent feature because of the small footprint, and it's a necessary evil if you don't have much space. Nonetheless, the In-Motion has several nice features. It can be used while seated, standing or in reverse to engage different muscle groups. The digital fitness monitor tracks useful data such as strides per minute, total workout time, calories burned and total strides performed. It turns on automatically when you start pedaling and has a pause feature if you take a water break. You can adjust the strenuousness of your workout by using the tension knob. Regardless of how high you turn it up, this trainer is quiet enough to use while reading, watching television or in the office. The pedals are heavily textured to ensure that your feet won't slip. Also, they are fairly large, so people with bigger feet should be able to use this elliptical machine. However, it's important to realize that the manufacturer stipulates that the machine is only for use by people who weigh less than 250 pounds. Further, unlike more expensive models, this trainer doesn't have handles. But that's not just a disadvantage, it can play for your favor. As a reward, you'll get an incredible workout for your core muscles whenever you use the trainer while standing. On the other hand, if you have balance issues, then this may not be the choice for you. The lack of handles may just mean that you can use some hand weights while exercising on the machine. This is an excellent way to dial up the intensity of your workouts. The In-Motion could be a good choice for someone who is recovering from a surgery or an injury because it can also be used in a seated position. Seated use will not give you a core workout, but it's still a fantastic lower body exercise. For its durability, versatility and good design, the Stamina In-Motion Elliptical Trainer deserves a place in your home. However, it's important to follow the manufacturer's weight guidelines. The Gazelle is the best elliptical in this round-up of low budget ellipticals. There is just one caveat, you cannot control the intensity of the Gazelle. This means you cannot make the workout more difficult. If you aren't trying to break records the Gazelle is just fine. If you are looking for a more intense workout checkout the Sunny Elliptical reviewed later in this article. If you have a bit more space, then the Gazelle Freestyle Step Machine may appeal to you. It has a larger stride length than the Stamina In-Motion, so it will take up considerably more room while in use. However, it folds for storage, which makes it less than 10 inches deep. The Gazelle weighs about 45 pounds, which means that it isn't too hard to move. Nonetheless, it's a sturdy machine that's capable of standing up to regular use. Because it has handles, it's possible to get a satisfying upper and lower body workout all at the same time. Even if you're not particularly good with tools, the Gazelle is easy to put together. Much of it is already assembled out of the box. With only a few tools, you can have your Gazelle set up in under an hour. I recommend that people who buy the Gazelle take the time to watch the included DVD. 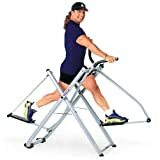 It has some really interesting exercise ideas that give you the opportunity to make the most of this elliptical machine. The handlebars are padded with high-density foam, so it's easy on your hands. The non-skid foot platforms are extra wide, so you won't have to worry about stability. Quiet, smooth operation ensures that you can talk on the phone or watch T.V. with ease while getting a wonderful workout. The computer is easy to use. It's capable of tracking calories burned, time, distance and speed. The computer is one of the components that users have to install, and some people have chosen to do without it. I find the data that is reported by these computers is especially valuable because it increases my motivation, so you might consider that before deciding whether or not to use the computer. Perhaps the Gazelle's biggest drawback is its lack of resistance. Unlike other affordable elliptical machines, it is not possible to dial up the tension. For users who are already in great shape, this may mean that they could get a more intense workout on another machine that has adjustable tension. However, the easy-to-use Gazelle might be perfect if you're just starting on the road to fitness. The manufacturer notes that the Gazelle is not for use by people who weigh more than 250 pounds. This compact model mimics the motion of the elliptical trainers at the gym. Unlike the Gazelle, this Exerpeutic machine has adjustable resistance through a strap system. It's easy to adjust the resistance up or down with a turn of the convenient dial. Like the other models I reviewed, this one has oversized pedals with plenty of ridges for traction. This makes it a safe workout even if you feel like you're less than sure-footed. The LCD computer display is a particularly nice touch, especially on an elliptical machine at this price point. It's easy to operate with a large button that lets you select between viewing distance, speed, time and approximate calories burned. There's also a scan function that I really like, which causes the computer to run through all of the data it's collecting so you can stay up to date. With dual action arms, it's really easy to get a full body workout. Plus, the arms are adjustable, so even people who are over six feet tall can use this model. The design is compact, which means that it can fit in smaller rooms without being particularly inconvenient. It does not fold up. However, you can tip it on end to use wheels to move it to a less conspicuous position in between workouts. Compared to the first two models on this review, the Exerpeutic has many parts that you have to assemble before you can use it. If you feel like you're not particularly good at following written instructions or are not comfortable using tools, then you may need to get the help of a handy friend. Once you've got it together, it pays to frequently check the screws and bolts to make certain that they remain tight. A little routine maintenance once a week or so will go a long way toward keeping this elliptical in good working order. Ignore the maintenance, and the machine is much more likely to break. The instruction manual has useful hints about maintenance and lubrication. If you follow those instructions, this is a great little machine. Before you buy the Exerpeutic, keep in mind the manufacturer rates it for users up to 260 pounds. If you weigh more than that, you'll probably do better with a sturdier machine that will likely cost a bit more. 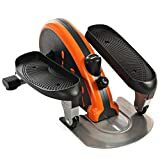 While this model is only a modest step up in price when compared to the other elliptical trainers reviewed here, it has some nice additional features. The most notable among these is the hand pulse monitoring system that allows you to track your heartbeat. If you're trying to hit a target heart rate but don't want to spend a fortune on an exercise machine, then this might be what you're looking for. The resistance system is magnet based, and can easily be dialed up or down while on the machine. Also easy to use is the computer that keeps track of speed, distance, time and calories as well as having a scan setting that runs through all of the data. The Sunny isn't just great if you are looking for a more intense workouts, but you have the option of working light or more intense. The Gazelle elliptical that I meantioned earlier is a great elliptical with excellent reviews from users, but its main drawback is that it doesn't let you adjust the intensity like this Sunny does. The Sunny Magnetic Elliptical Trainer features two sets of handles. One set is equipped with the pulse monitor system and remains still. The other handles move smoothly back and forth with your stride. Switching between one set of handles and the other is simple even in the midst of a tough workout. With sturdy construction, you can expect this machine to last for a reasonably long time. Once again, it's vital that you provide routine maintenance like tightening nuts and bolts and lubricating. Doing so keeps this elliptical trainer running smoothly and silently. Perhaps the major downside to this generally good model is that its weight capacity is just 220 pounds. This unit is not designed for someone who is dealing with a serious weight problem. Another potential drawback is that this model does not fold up, nor does it have wheels that would make it easy to move out of the way. If you choose the Sunny Magnetic Elliptical Trainer, it's best to have a permanent spot for it in your home. Getting good cardio equipment doesn't have to be expensive. 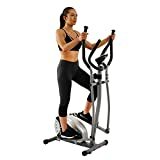 Ellipticals are much less expensive than treadmills and getting any of the 4 elliptical trainers reviewed in here will burn calories and get you in shape just as good as any other more expensive equipment can. But don't forget you don't just have to buy them, you also have to use them!